We are not talking about the Disney reincarnation of Pinocchio, a brightly clad young puppet closely resembling Mickey Mouse, who hops about from one misadventure to another. 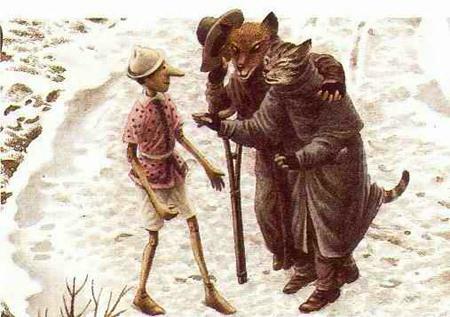 We are talking about the original, unabridged, version by Carlo Collodi. I recommend the 1988 Alfred A. Knopf edition illustrated by Roberto Innocenti. The translation is lovely and the vocabulary is challenging but easily understood in context. What really makes this edition so compelling for young and middle level readers are the illustrations. 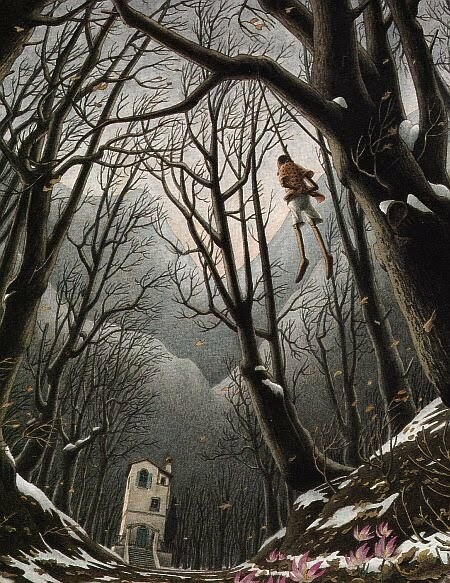 Roberto Innocenti’s illustrations are breathtaking. These are not beautiful pictures. They are morose, macabre and slightly disturbing. Children are completely enthralled by the images. The pictures perfectly complement the edgy dangerous mood of this cautionary tale. Here is the original block of wood from which Pinocchio is carved. 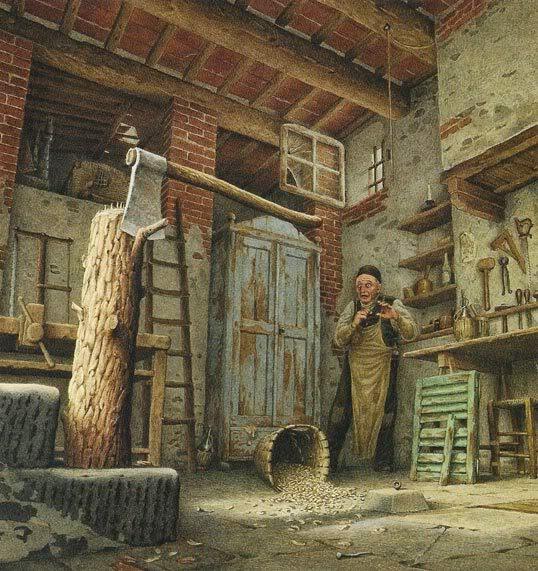 The wood maker is shocked to hear the wood crying out in pain each time he attempts to chop it into bits. In great haste he gives this wood away to Geppetto who will carve the famous puppet from this magic wood. Despite Pinocchio’s repeated bad behavior he does have a repenting heart and this is an endearing characteristic. 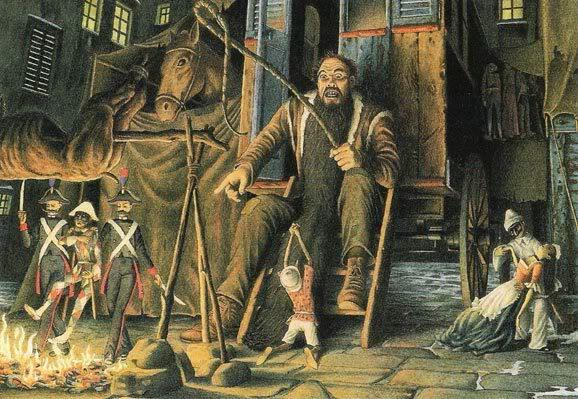 Here Pinocchio begs the Showman to take his life and spare the life of the Harlequin. The Showmaster spares them both and Pinnochio has another chance to improve his behavior. 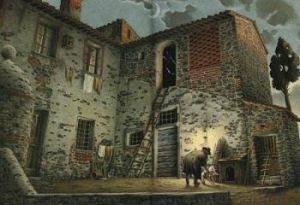 Pinocchio sets off with the best intentions and plans to reconnect with his loving father, Geppetto. Unfortunately, he is accosted by the wily fox and cat who entice him into burying his gold pieces in the Field of Miracles. Let us just say that this encounter leads to nothing but profoundly poor fortune. Fortunately Pinnochio’s luck will prevail and his ever-repenting nature will continue to procure him a new chance to get on the path toward righteousness. Having finally procured his freedom, Pinocchio is once again on his way to see his father. In his hurry and hunger, having recently escaped from prison, Pinocchio stops to steal some grapes. He is apprehended and forcibly employed as a guard dog for the local farmer. His excellent job as an honest guard dog causes the grateful farmer to set Pinocchio free. This is one of the best read-aloud bedtime stories. 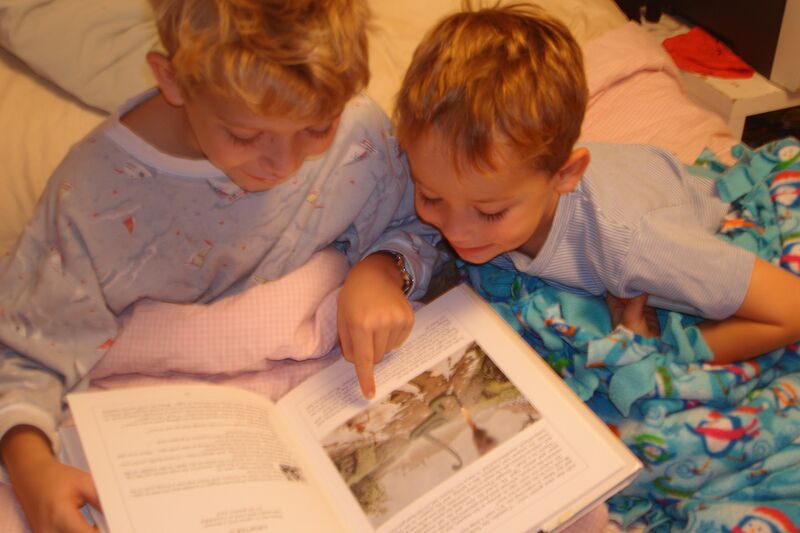 Each night Bounce and Scooter hurry-hurry-hurry to get into bed so we can continue with the Pinocchio story. They immediately identify with Pinocchio and his bad-boy antics. They are not disturbed by his predicaments. They have confidence that he will learn to behave himself and will be redeemed by the end of the story. Pinocchio, like all classic tales, has a clear message and honestly reflects the emotions and actions of real-life boys and girls. This is an eminently satisfying tale of the battle between right and wrong. Bounce and Scooter know that right will prevail, but it is so much fun to watch Pinocchio easily being mislead in the meantime.